The prompt for this month's Smile for the Camera carnival is, "transportation". I had sooo many ideas for this prompt but in the end my Motor City roots reigned supreme. 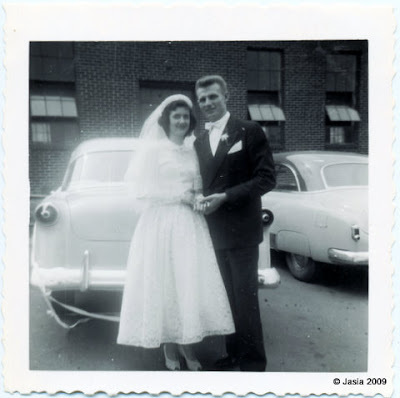 Here is a picture of my dear mother and father in law as they were leaving their wedding reception on June 6, 1953 somewhere near or in Barnesboro, PA where they were married. The decorated car behind them transported them to their honeymoon in the Wisconsin Dells and to and from work at Murry Ohio Mfg. Co, in Cleveland, OH (they both worked at the same place). Later, my father in law worked for Ford Motor Company from 1966 until he retired in 1993. He was an engineer in the Manufacturing and Development Lab where he specialized in new welding technology. He has several patents in his name. You could say he engineered transportation!